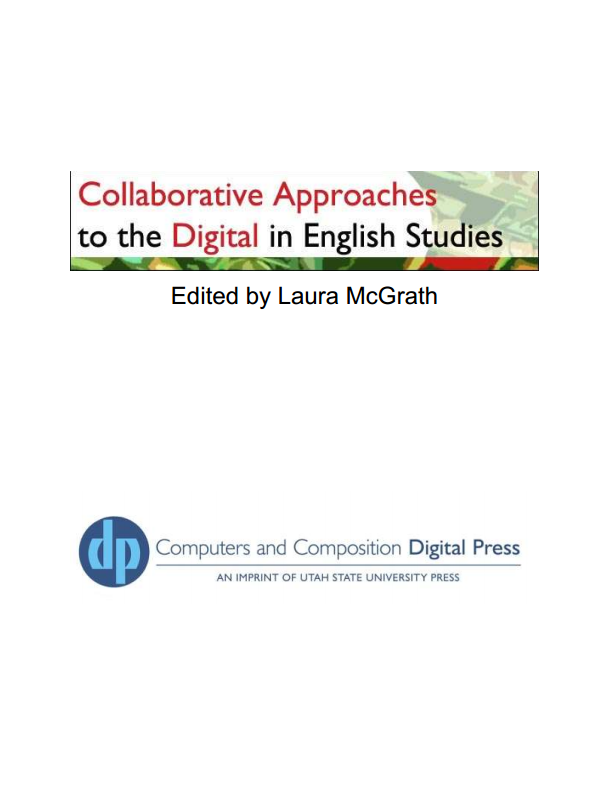 While all the chapters in Collaborative Approaches to the Digital in English Studies were instructive, three concepts really struck me in this collection. 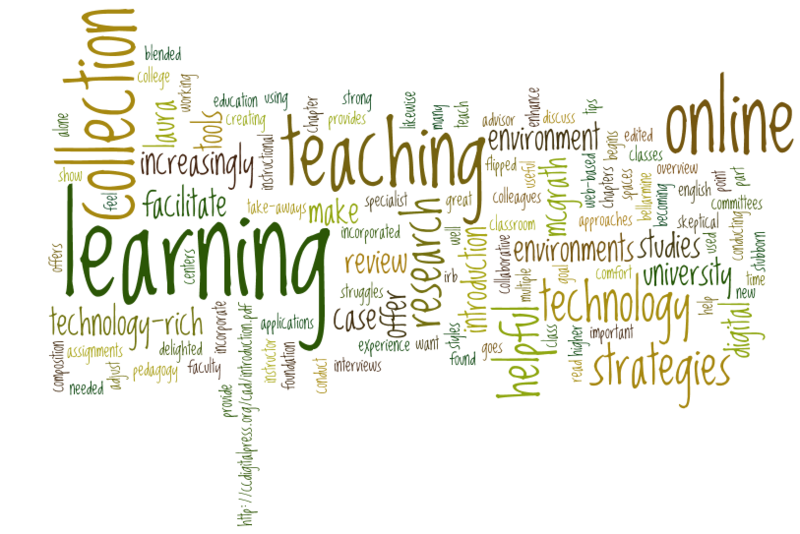 One was how many instructors are using Google products in their online teaching. Google Docs, Blogger, and YouTube are easy for students and faculty to use because they are open to all connected users of technology, not just students from one particular university. As I tell faculty members at Bellarmine University, learning how to use a program like Blackboard has little transfer to anything outside higher education (besides the process of learning to use digital sites), but learning to use free, cloud-based programs (like those offered by Google) has relevance to productivity outside the historically cloistered and closed higher education system. Another important point that this collection addresses is the challenge of keeping software and technology learning relatively low-stakes, while pushing students and encouraging them to explore possibilities and take risks in their communication products. 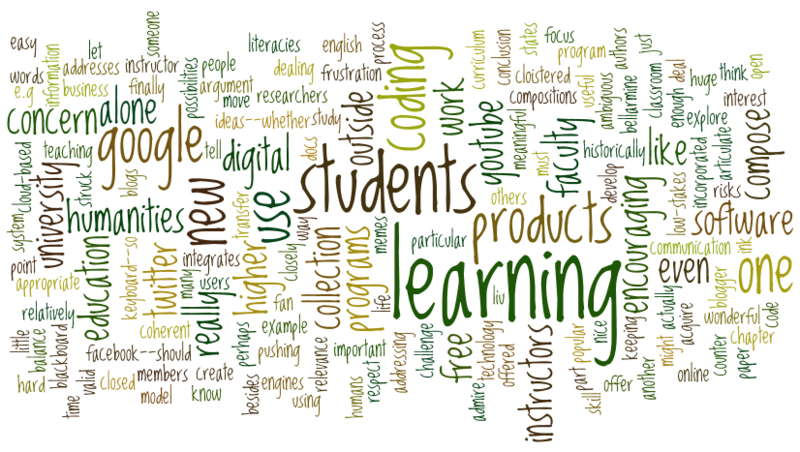 As an instructor who integrates the learning and usage of new programs as part of the curriculum, it’s nice to know I am not alone in my concern with the balance of addressing students’ concern with grades while encouraging them to acquire new digital literacies as they compose digital products. Finally, the authors in this collection offer a valid counter argument to the move in digital humanities to focus on coding. While coding is a wonderful skill to develop, we must also respect, and even admire, researchers and instructors who work with popular, free software, and those who work closely with others who code to create meaningful and useful compositions. As Liu states in Chapter 9, “It is ambiguous, for example, what some of the new information engines (e.g., Twitter) are actually for, let alone what their business model might be.” As people who study humanities, the way humans compose and articulate their ideas--whether it be with YouTube, memes, Twitter, blogs, ink on paper, or Facebook--should all be of interest and even incorporated into our classroom when appropriate.